Orlando Steps Up To Make Its Streets More Pedestrian-Friendly Much of Florida was designed with cars, not people, in mind. Four of the state's metro areas top the nation in pedestrian deaths per capita. Now, planners in Orlando are working hard to change that. Florida is home to the country's four most dangerous large metro areas for pedestrians, according to a new national study. Orlando tops the list, followed by Tampa, Jacksonville and Miami, pictured above. Semoran Boulevard in Orlando, lined with gas stations, strip malls and bus stops, is a good example of what's wrong with the roads in this busy Florida city. It's the most dangerous street in a city that ranks No. 1 in the nation for pedestrian accidents, according to a recent national study. There have been 28 crashes involving pedestrians — and six deaths — on this stretch of road over the past seven years. Mighk Wilson, a smart-growth planner with the regional planning agency MetroPlan Orlando, says several of Semoran Boulevard's features make it so dangerous. It's six lanes wide, with no median. And it's a traffic artery, with cars traveling at 40 miles per hour or faster. "You can see here, there's strip commercial and convenience stores," Wilson explains, motioning to the busy road. As he talks, a pedestrian begins crossing right in the middle of the street, dodging his way across the six lanes of traffic. Visibility has been a problem here, and many accidents have occurred at night. To improve safety, better lighting was recently installed and there are now plans to put in a median strip. Orlando's road system was largely built in the '60s, '70s and '80s, after Disney and other theme parks turned this city into a family entertainment destination. It was a time when pedestrians were an afterthought for road planners. Billy Hattaway, a district secretary with the Florida Department of Transportation, says pedestrian safety is a problem for cities throughout the Southeast. "Because of the nature of land development patterns, we ended up with a lot of higher-speed, larger roads, because people are driving longer distances to get back and forth to work," Hattaway says. "The pressure to increase the size of roads is what contributed to the problem." Hattaway is a bike and pedestrian safety zealot. He returned to Florida's transportation department from the private sector three years ago, after a report first singled out the state as the nation's most dangerous for pedestrians. 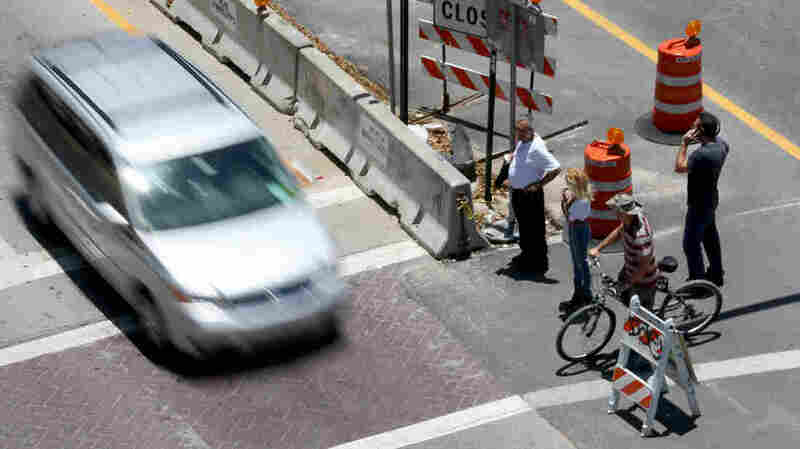 Since then, Florida has developed a long-range plan for improving pedestrian and bike safety. Some of it involves improving crosswalks and encouraging people to use them. It adds roundabouts where possible and other traffic calming measures to reduce automobile speeds. That recognizes a basic fact about automobiles and pedestrians: Higher speeds mean much higher fatality rates. "At 20 miles per hour, 1 in 10 pedestrians will likely be killed. When you go up to only 30, you have a 50-50 chance," Hattaway says. "When you go to 40, about 85 percent of the pedestrians die who get hit at those speeds." In Florida, traffic planners say the problem isn't just how streets are designed. Drivers often don't yield to pedestrians at crosswalks. Part of it is ignorance of the law. Part of it is driver culture. "People want to go where they want to go, and they think the pedestrian doesn't have a priority, when in fact they do," Hattaway says. Changing driver culture may be more difficult than redesigning highways. In Orlando, a coalition of groups that includes traffic planners, government, health care groups and the public schools is trying, with a campaign called "Best Foot Forward." Law enforcement agencies have started conducting regular sting operations, putting plainclothes officers at crosswalks and issuing tickets and warnings to violators. That's for the short term. For long-term change, Amanda Day, project director at Best Foot Forward, says she's looking to the schools. Day compares the effort to get drivers to yield to pedestrians to earlier campaigns around smoking, seat belt use and recycling. Beginning this fall, Orlando schools will add pedestrian safety to the elementary school curriculum. The idea is to use children to reach the parents. "When your child is in the back seat, and Mom is blowing through a crosswalk and there's a pedestrian there, and your 6-year-old says, 'Slow down, Mom,' that starts that behavior change," Day says. It's too early yet to see concrete results, but officials here are optimistic their campaign is working. Day's group monitors a number of streets in the city, and on roads where the speed limit is 30 miles per hour or less, Day says, drivers are yielding more often. Previously, drivers stopped for pedestrians 12 percent of the time. Today, she says, half the drivers are yielding. That's no help to the other half, still left dodging oncoming cars. But in the nation's most dangerous city for pedestrians, it's a start.